In the lab: Readings to 0.1° C; near perfect stability. In the field: A superior'cold junction reference'which maintains accuracy with ambient temperature changes from O°C to 50°C; sealed construction, carrying case. For recording: Analog output for strip chart recording is a standard feature. When you must make precise temperature measurements, Physitemp can provide you with a very accurate monitor and thermocouple microprobes. 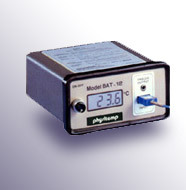 Physitemp monitors have a resolution and accuracy of 0.1°C in the 0-50°C range and are traceable to NIST standards. Other competitive electronic thermometers might have 0.1°C resolution, but their accuracy is usually to 0.5°C or worse. Furthermore, all our type T clinical probes are guaranteed accurate to 0.1°C, due to our stringent wire standards. These are five times more accurate than competitive probes made with regular "Special Limits" wire. In addition to our precise temperature monitoring equipment, we offer a complete line of thermoelectric heating and cooling stages for both microscopes and microtomes. Our thermal stages fit most microscopes and enable the temperature of a specimen to be maintained and regulated at any temperature between -20° and +100°C to within 0.1°C. We also make custom stages for special applications. Our freezing stages for microtomes offer an inexpensive solution to frozen tissue sections and fit easily onto most microtomes. Freezing starts immediately and can be maintained indefinitely. Our neurological testing devices, the Vibratron II, vibration sensitivity tester and the NTE-2, thermal sensitivity tester were designed to measure the sensitivity of a person's fingers and toes in order to detect peripheral neuropathy non-invasively. Our neurological testing devices are being widely used in current medical applications for the detection and diagnosis of Carpal Tunnel Syndrome as well as in pharmaceutical research studies on Diabetes and AIDS. Physitemp's offices and manufacturing plant are located in Clifton, NJ about 10 miles west of New York City. Since we supply private label products to several major marketers of medical instrumentation, our production processes adhere to Good Manufacturing Practices as outlined by the FDA. Every unit that we sell is inspected and tested before shipment. We hope that our Web Site will not only interest you, but also help you understand the broad capabilities of our temperature monitoring and control systems. We welcome your comments and ask that you let us know about your own uses of Physitemp products. For additional product information see OUR PRODUCTS.